Diamond Waste is a locally owned and operated dumpster rental service company that specializes in serving the waste management needs of large construction sites throughout the Baltimore - Annapolis - Washington, DC area. 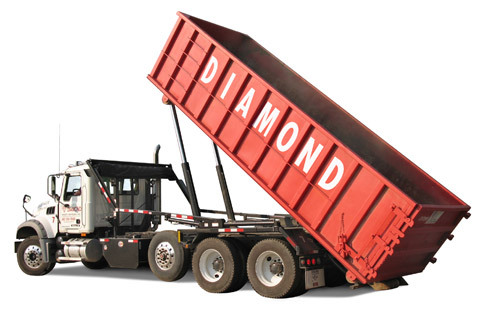 When you rent a dumpster from Diamond Waste, you get a dumpster rental from Diamond Waste along with prompt courteous service and direct communication. We are not a middleman, big box or large national chain. We will always take the time to listen to your dumpster rental needs and concerns because the more we understand the particulars of your job site, the better we can service your rubbish removal needs. When your waste removal provider is a "no show" work crews are left waiting, costing you time and money. Call Diamond Waste. Our prompt, dependable service helps to keep your crews working‚ not waiting for the dumpster. Whether you need immediate, same day dumpster rental service or daily, long term, 24/7 scheduled waste removal solutions, you can rely on a Diamond Waste roll-off dumpster to be there! We're not just talkin' trash‚ we're moving it too! Diamond Waste is committed to providing courteous, attentive dumpster rental service to each customer. It's a priority for us. We strive to know you and understand the particular needs and challenges of your job. That way we can serve you better. We like to maintain close communication regarding dumpster pick-ups and scheduling, and we're flexible as your job site conditions change. There are no surprises with Diamond Waste. Every Diamond Waste truck is equipped with a two-way radio and GPS‚ so we always know the location and ETA of your next dumpster pick up. We take pride that our customers are never left guessing when their waste will be removed. Our phones are answered 24/7–you will never get voice mail with Diamond Waste. 15, 20 and 30 yard roll-off dumpsters for large construction & demolition projects. George's, Harford, Howard and Montgomery Counties and Northern Virginia. ETA of your next dumpster pick up. documentation. We are a USGBC Member. Recycling dumpster rentals for the removal of "metal only," "wood only," "concrete / masonry only" and other recyclable materials. Scheduled dumpster service 24 hours per day, 7 days per week and our dispatch is always available to answer your call. Experienced at obtaining security clearances to access and provide dumpster services to secure installations such as airports, military bases and government facilities. Call today to schedule service or to find out how Diamond Waste can provide superior roll-off dumpster rental service for your job site. Mixed construction & demolition dumpster rental loads consist of unwanted building materials and waste resulting from site preparation. The dumpster may contain lumber, drywall, wiring, pipe, metal, plastic, paper, cardboard, insulation, roofing, non-asbestos tiles, demolished cabinets, furniture and fixtures, and small amounts of concrete, masonry and asphalt debris. In order for a dumpster rental load to be classified as mixed C&D it MUST NOT contain large amounts of land clearing debris such as trees, stumps and brush clippings. It also MUST NOT contain large amounts of concrete, masonry, asphalt or soil. Mixing other types of waste in the dumpster with your C&D load can result in load reclassification. 1) Source Separated - recyclable waste materials are separated into designated roll-off dumpsters at the job site. Source separated is the most cost efficient for large amounts of recyclable material. 2) Commingled - recyclable waste materials are combined into a single dumpster and separated off site at a recycling center. Commingled is more expensive than source separation, however is the best choice for sites with space limitations. If your job site will be using source separation, Diamond Waste will deliver marked containers for the specific materials. It is important that other waste materials ARE NOT mixed in with the specific recyclable. Mixing other wastes in the dumpster with your specific recyclable load can result in load reclassification. Green waste dumpster rental loads consist of biodegradable tree trimmings, branches, brush, garden plants, leaves, and grass clippings. Green waste DOES NOT include treated lumber, creosote railroad ties, concrete / masonry debris, rocks, sod, soil, trees, stumps or general waste. Mixing these items in the dumpster with your green waste load can result in load reclassification. If you have trees, tree stumps, treated wood or creosote railroad ties please call and ask about our specialty waste removal service. General solid waste dumpster rental loads can contain food and kitchen waste, yard and brush trimmings, wood, paper, cardboard, glass, plastic, metal, construction and demolition debris, carpet, furniture and fixtures, clothing, carpet, old toys, bottles, cans and general rubbish. General solid waste loads CAN NOT contain hazardous or toxic waste or other materials requiring special handling (see terms & conditions for more information).